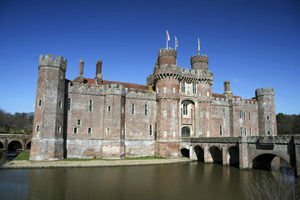 Herstmonceux Castle is a medieval castle, built primarily to demonstrate the greatness and the comfortable lifestyle of its rulers, than the protection of land and territory defense. To this day the castle retains this function, plus as an attractive historic tour, the castle offers numerous and excellent opportunities to celebrate their holiday in a romantic atmosphere or spend several conference days with their counterparts in the litery room. Herstmonceux Castle is a massive building, built in 15th century style of the Tudors. It stand in the English county of East Sussex , as part of the province Herstmonceux. Here annually for three days in August, history comes alive because the palace is a natural background for an English medieval festival. At this time of year the in the castle you can hear chivalrous combat, nice medieval music, falconry demonstrations, medieval merchants who offer on their stalls intriguing products, authentic roasted pig and much more interesting and exciting links back to the Middle Ages. On the site of today's castle was a massive building back in 11th-12th century. For the first time in the historic annals, the castle was mentioned in a book by William the Conqueror, which says that in the castle lived the Hearst family a man named Wilbert. In 12th century, the marriage between Hearst and the Monceux families created a new name "Herst of the Monceux", hence the castle's present name. To this day the castle is considered as one of the oldest still in good repair houses in the UK. Until 1946 the palace was owned by various private owners. Then becomes the property of Admiralty. From 1957 to 1998 Herstmonceux Castle hosted the Royal Greenwich Observatory, before it moved to Cambridge. Today at the castle can still be seen several telescopes, but the biggest was moved to La Palma, Canary Islands in 1970. Since 1994 Herstmonceux Institute operates internationally and is called - Queen's Bader International Study Centre. Multifunctionally the castle offers excellent facilities for weddings, conferences, international meetings, etc. Belonging to the castle are it's beautiful gardens, which are known as Elizabethan gardens. Walking the gardens offers pleasant moments of relaxation and forest trails that lead to several herbal and pink park. Part of the Herstmonceux Castle is surrounded by beautiful lake, which complements the romantic atmosphere of the building.